Titan No Rinse Sanitiser sanitises and removes bacteria that cause unpleasant odours. Perfect for all food contact surfaces and equipment. Great for bathrooms, rubbish bins and drains. 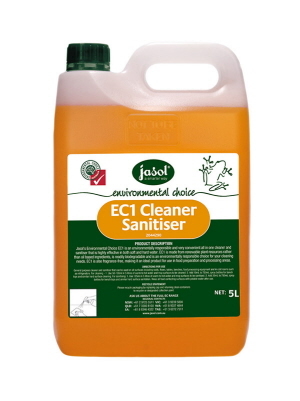 Jasol EC1 Cleaner Sanitiser is fragrance-free, readily biodegradable, environmentally friendly, and very convenient all in one cleaner and sanitiser highly effective with both soft and hard water. Fragrance free makes it ideal for use in food preparation and processing areas. Environmentally responsible - GECA certified. It is made from renewable plant resources rather than oil based ingredients. 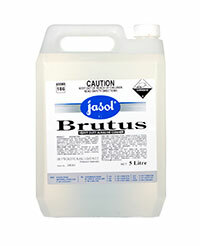 Jasol Brutus Heavy Alkaline Cleaner & Degreaser with sanitising properties. Specifically formulated for heavy duty cleaning and degreasing of concrete floors, food processing equipment, fishing boat bilges and decks, engine degreasing, etc. even in extreme hard water conditions. Industrial grade, highly active, emulsifies grease and oils. 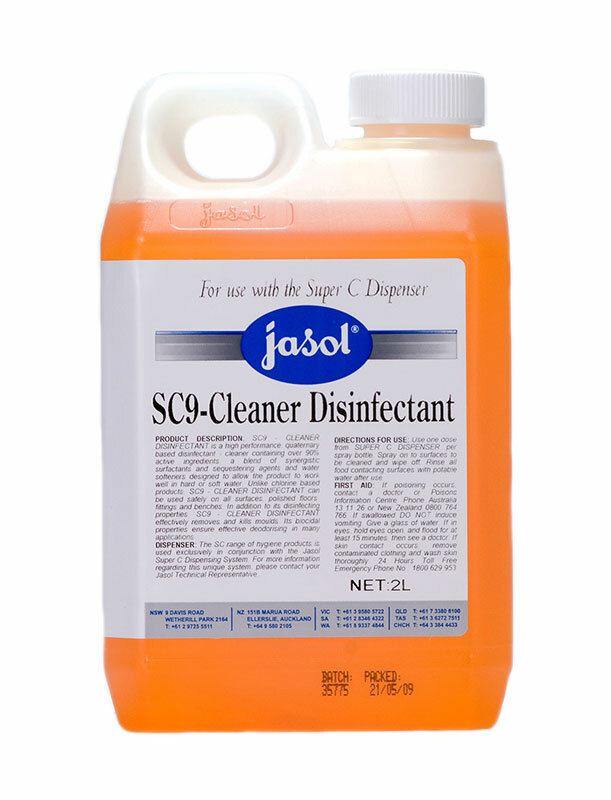 IT is approved by AQIS and NZFSA as a general cleaner - type A for use in all departments. It is a premium alkaline cleaner for heavy duty cleaning and degreasing in shopping, industrial and food processing areas. Potent Quaternary Ammonium Based Sanitiser. 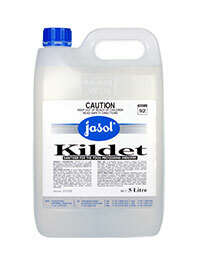 Jasol Kildet No Rinse is a disinfectant and sanitiser for food processing and handling. 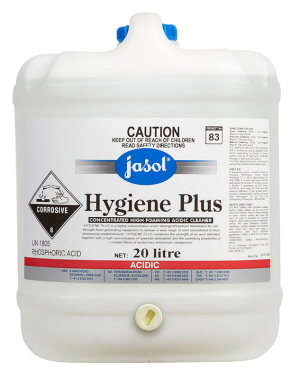 Approved by AQIS as a no rinse sanitiser for use on walls, floors, tables, benches, food processing equipment, cold rooms and refrigerators. 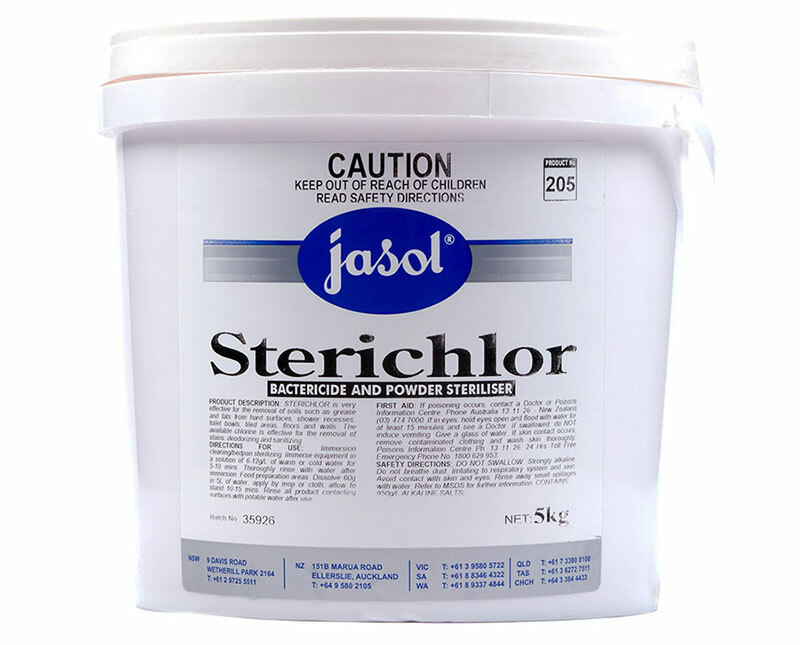 Jasol Sanclean contains quaternary ammonium compounds. Effectively removes and kills moulds in cold rooms and refrigerators. AQIS Approval. Used safely on all metal food processing equipment and fittings. Jasol EC2 No Rinse Sanitiser is a chlorine free, biodegradable and environmentally responsible, highly effective no rinse sanitiser. 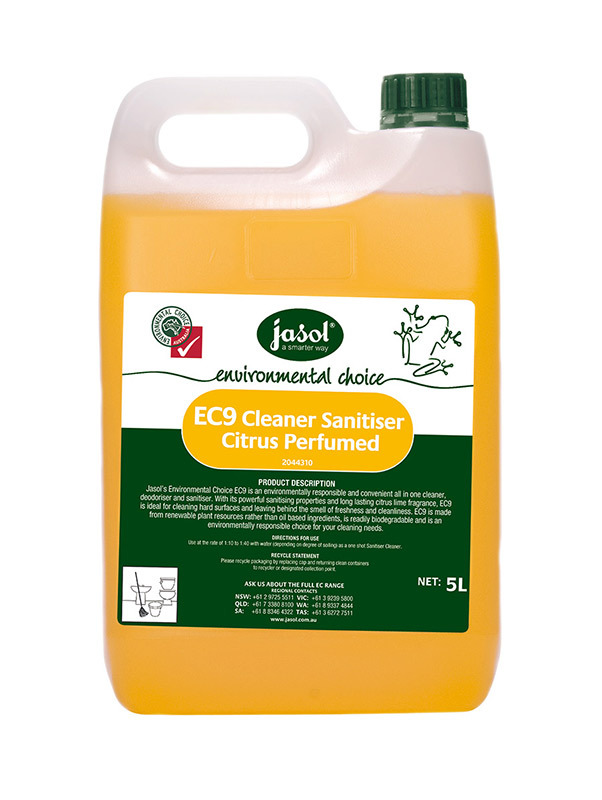 The perfect sanitiser for all food contact surfaces and equipment for its chlorine free. Jasol EC9 is an environmental friendly, biodegradable all in one cleaner, deodoriser and sanitiser which is ideal for cleaning hard surfaces. It leaves behind a smell of freshness and cleanliness with its long lasting lime fragrance. Environmentally responsible - GECA certified. It is made from renewable plant resources. Jasol Mountain Mist Detergent Sanitiser is a detergent disinfectant blend of the finest eucalyptus oils and non-toxic, biodegradable surfactants to combine anti-bacterial and deodorant activity with excellent cleaning efficiency. It is available in 5L and 20L. 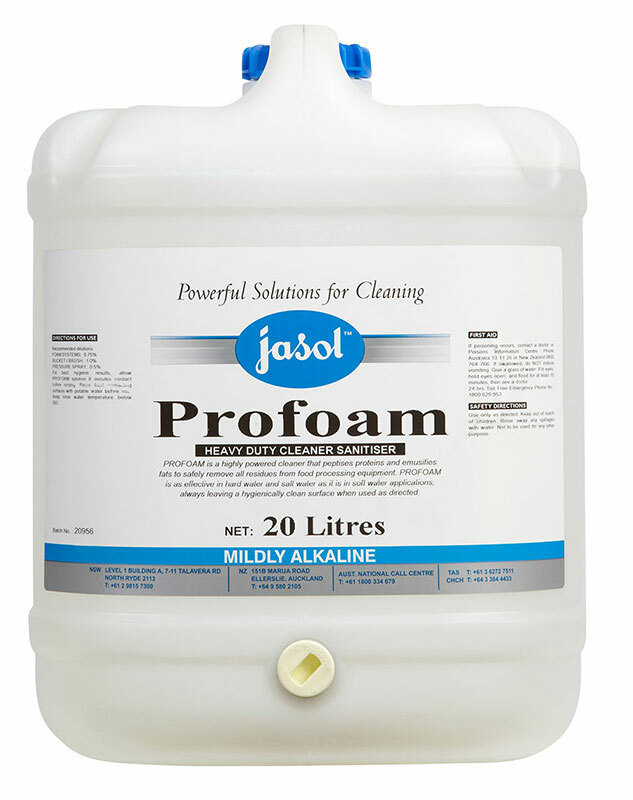 Jasol Hygiene Plus Concentrated High Foaming Acid Cleaner is ideal for removing protein bloom, milkstone and hard water scale etc. 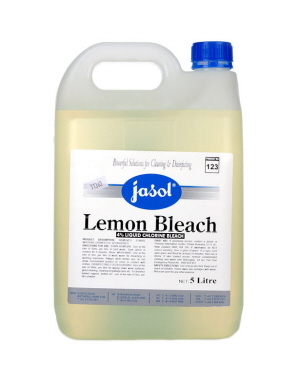 Suitable as an alternative cleaning where regular alkaline cleaner is used. Jasol Hygiene Plus combines the strength of an acid, blended together with a high concentration of powerful detegents and the sanitising properties of a unique blend of quarternary ammonium compounds. AQIS Approval. HALAL Approval. Available in 20L and 200L. 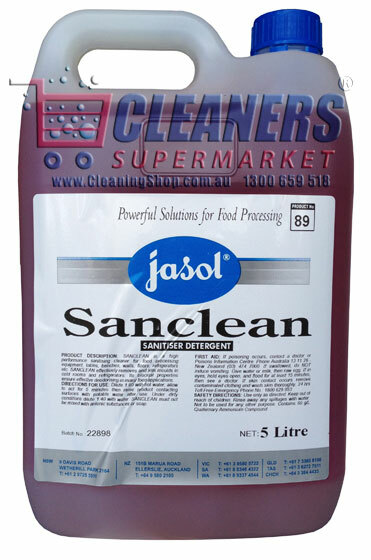 Jasol Chlorsan Chlorinated Low Foaming Sanitiser is ideal for use in food processing areas. 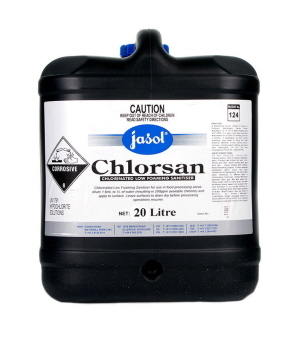 This oxidising agent used as a source of chlorine for removal of proteins. Jasol Chlorsan Chlorinated Low Foaming Sanitiser is used in conjunction with other alkaline membrane cleaning products, this is an exceptional agent for removing proteins. Ideal in high protein membrane plants. AQIS Approval. HALAL Approval. Available in 20L and 200L. 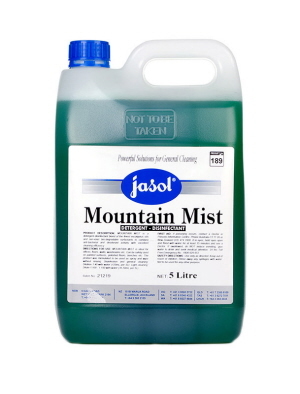 Jasol Proxitane Non-Foaming Sanitiser passivates stainless steel, may be used under a carbon dioxide head, breaks down to acetic acid and oxygen. AQIS Approval. 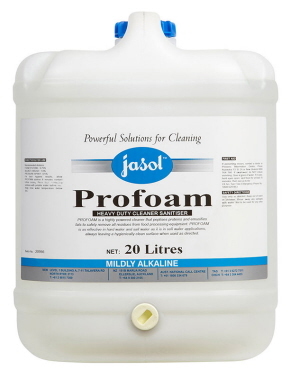 Jasol Profoam Heavy Duty Cleaner Sanitiser is a highly powered cleaner that peptises proteins and emulsifies fats to safely remove all residues from food processing equipment. 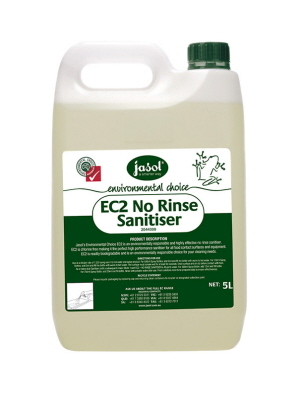 Providing effective cleaning and sanitising in one easy step. It is as effective in hard water and salt water as it is in soft water applications, always leaving a hygienically clean surface when used as directed. 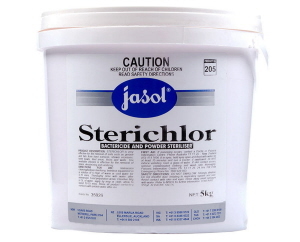 Used in all food preparation and storage areas. It exhibits excellent grease and protein removal. AQIS Approval. KOSHER Approval. HALAL Approval. Available in 20L and 200L. 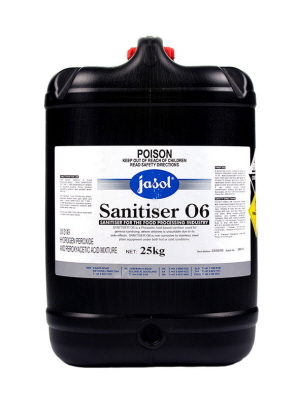 Jasol Sanitiser O6 is a hydrogen based sanitiser Peroxide & Peroxyacetic Acid designed for sanitising in no rinse applications on food processing equipment. It will not corrode stainless steel plant and equipment under both hot or cold conditions. This sanitiser is ideal for general sanitiser where chlorine is not suitable due to its side-effects. AQIS Approval. HACCP Compliant. Available in 20kg and 200kg. 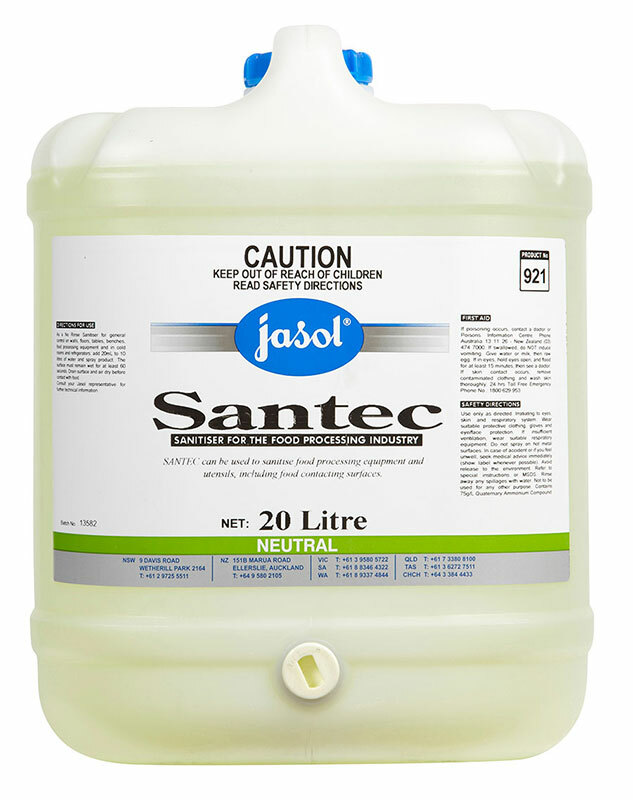 Jasol Santec QAT Based Sanitiser can be used to sanitise food processing equipment and utensils, including food contacting surfaces. This sanitiser is a 2 chain QAT that is effective against gram- and gram + bacteria. AQIS Approval. HALAL Approval. Available in 20L and 200L. 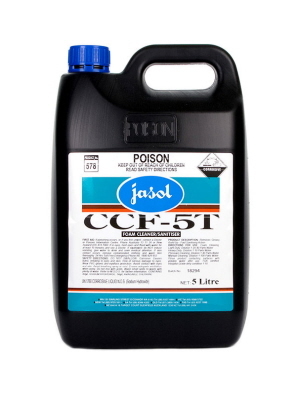 Jasol CCF-5T Foam Cleaner Sanitiser is a heavy duty chlorinated alkali foam detergent, ideal for removing fats, oils, protein soils and most food residues from stainless surfaces, conveyor belts and most materials found in a modern food production facility. AQIS Approval. KOSHER Approval. HALAL Approval. Available in 5L and 20L. Jasol SC1 Cleaner Sanitiser is a non-perfumed, non-hazardous with high performance quaternary based disinfectant, cleaner containing over 90% active ingredients. A blend of synergistic surfactants and sequestering agents and water softeners designed to allow the product to work well in hard soft water. Unlike Chlorine based products, SC1 Cleaner Sanitiser can be used safely on all surfaces, polished floors, fittings and benches. In addition, with its disinfecting properties, it can effective remove and kill moulds. Its biocidal properties ensure effective deodorising in many applications. 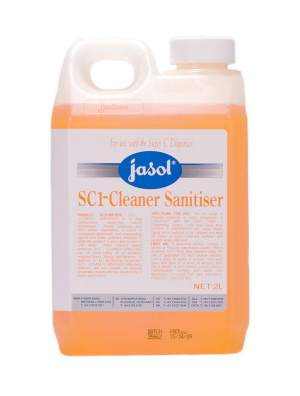 Jasol SC2 Sanitisier effectively removes and kills moulds in cold rooms and refrigerators. Its biocidal properties ensure effective deodorising in many food applications. Jasol SC2 Sanitiser is a non-hazardous, non-perfumed, high performance quaternary based sanitiser designed to be applied on food processing equipment without the needs to rinse. 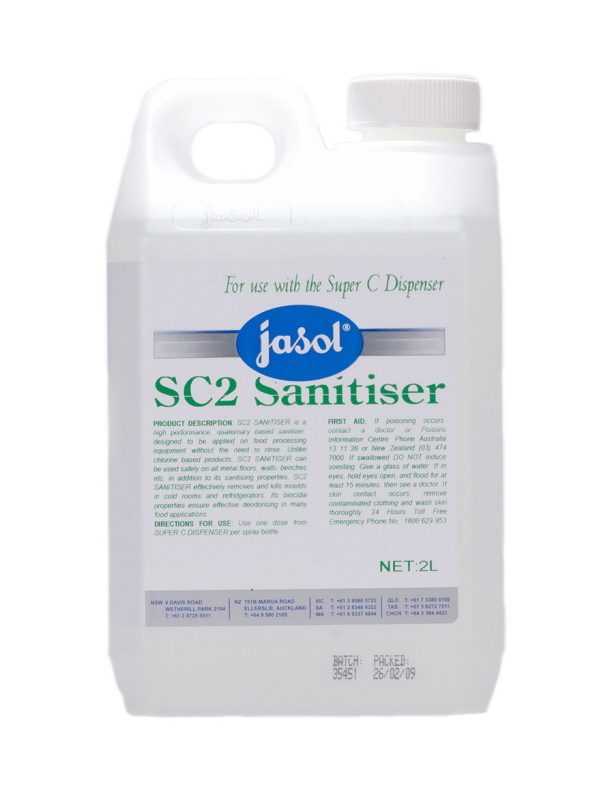 Unlike chlorine based products, SC2 sanitiser can be used safely on all metal floors, walls, benches etc in addition to its sanitising properties.